Chanel, an Akita from Prenton, Merseyside won the Utility Group title at Crufts 2018 today (Saturday 10th March), qualifying them for a place in the Best in Show Final tomorrow. Chanel (Ch Stecal’s Love at First Sight JW), aged 4, will return to the Genting Arena at the NEC in Birmingham for a place at the final at the world’s greatest dog show, Crufts, with her handler Faye Bevis, who co-owns Chanel with Carol Bevis and Rachael Corr. 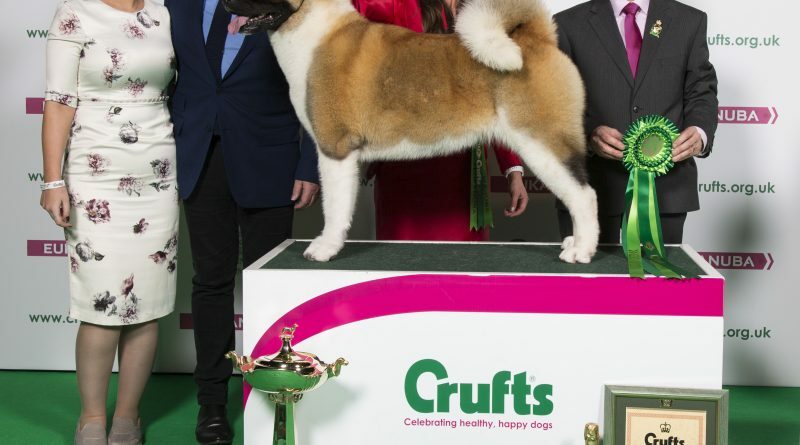 People around Britain and the world will be watching to see which dog is crowned Best in Show tomorrow as the final is shown live on Channel 4 and streamed on the official Crufts YouTube Channel. Almost 21,000 dogs are competing over the four days for one of just seven places in the Crufts final and a chance to win the most celebrated title in the world of dogs. Caroline Kisko, Kennel Club Secretary, said: “We are thrilled to see Chanel chosen as the Utility Group winner today. Chanel and Faye should be very proud of reaching the prestigious Best in Show final – it’s an incredible achievement and one that not many get to experience in their lifetime. “Crufts celebrates healthy, happy dogs and recognises the special and unique bond between dogs and their owners. Chanel is such a wonderful dog that clearly has a great relationship with her owner, and is at home in the show ring. Reserve in the group went to the Standard Poodle, USCH Dawin Steal My Heart. 3rd was the Miniature Poodle, while 4th was the Toy Poodle. For more information, visit www.crufts.org.uk. The full results for Crufts 2018 can be found online at www.press.fossedata.co.uk.